In KZ1, Bas Lammers races like a champion (an unlucky one). 6th in the qualifyings, on Saturday he wins both heats and conquers pole in Final 1: here he is quickly up front, then is sent out by a contact. Sunday he is again ultra-fast (8th, with best lap, and 4th in the heats) and in Final 2 he charges from 6th to cut the finish-line 1st: yet, victory fades from view after the race, when he is told he passed with yellow flags . With the corner on the left and flags on the right, he doesn’t notice the alert and a win that would have set him just 3 points from the championship leader goes up in smoke: he is 5th. A good run also for Patrik Hajek: 4th in the qualifyings, he suffers in the heats, but recovers in the main races: 12th (from 22nd) in Final 1 and 8th (from 21st) in Final 2. In KZ2, Martin Doubek makes steadiness his strength: 12th in the qualifyings, he is 10th after the heats both days. He closes the finals 11th and 9th, securing his chance at the title (7th). Praga Kart also races in KF2 with Karol Dabski and Jack Barlow: the English driver qualifies despite fierce competition, then doesn’t leave a mark, but his Polish mate is 6th in Superpole and 7th after the heats (with a 2nd place), then in the finals is penalized by contacts and ends close to the top 10 (13th). 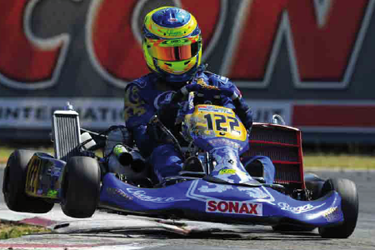 The next WSK Euro Series date is August 5th in Zuera, Spain.